Williams’ decision in 1969 to admit women was one of the best the College ever made. 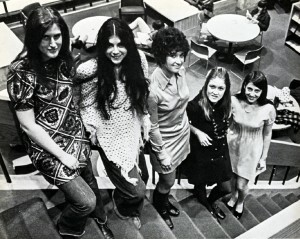 The Class of ’70 was involved in the transitional “College Exchange Program.” This led to the full admission of women in September, 1971, and the awarding of college degrees to women in June, 1971. She tells us of womens’ first ever semester at Williams below, and we are proud to count her among our classmates. The decision to “go coed” strengthened Williams in almost every way: the student faculty ratio increased from 10:1 to 12;1; student body size increased from 1200 to 1800 by 1975, which strengthened departments, majors, and admissions. Compare 1970 and 2017 Williams’ admissions, departments and majors, , sports and activities, new facilities, and Williams’ standing in college rankings as one of the premier small colleges in the country. Much of this can be attributed to the solid decision to admit women in 1969. Going coed actually was the only reasonable decision Williams could have made. Princeton and Harvard already had started admitting women full-time in 1968. Amherst and Wesleyan also were considering going coed, and would implement the decision around the same time as Williams. 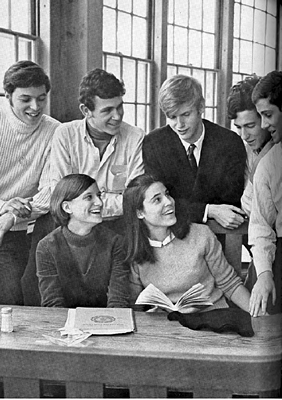 Williams competitors in the late ’60’s were “going coed.” Williams had to make the same decision to remain competitive for the strongest applicants in the Northeastern pubic and private schools, which were Williams’ base. Rich Wendorf, and Paul Wickes were members of the “Student Committee on Coordinate Education,” which “worked closely with the joint faculty­ trustee committee” on the admission of women to Williams. See The Response Seems Favorable, Women Winter 1969, Alumni Review, Winter 1969. Rich Wendorf visited “Hamilton/ Kirkland, Swarthmore, Middlebury, Harvard/Radcliffe and Brown/ Pembroke.” Women Winter 1969. Admitting students on a regular basis starting in 1971 increased the student/faculty ratio (a major reason for the College’s decision, see Women: The Response Seems Favorable, in Women Winter 1969, Alumni Review, Winter 1969. With a student body increase from 1200 to 1800, allowed for more majors, departments, activities, stability, reputation, and a strong admissions pool. See Departments and Majors, Then and Now, and Compare Admissions, Class of ’70 and 2017. Many of the original exchange students still remain supportive of the college and for some, their Williams experience was life changing. Review the College’s “democratic,” “social,” and financial reasons for “going co-ed. Relate the Coed Exchange Program to Williams’ #1 US News rankings for the past 17 years. But what’s really in the rankings? The College’s traditional “commitment” to those it admits.